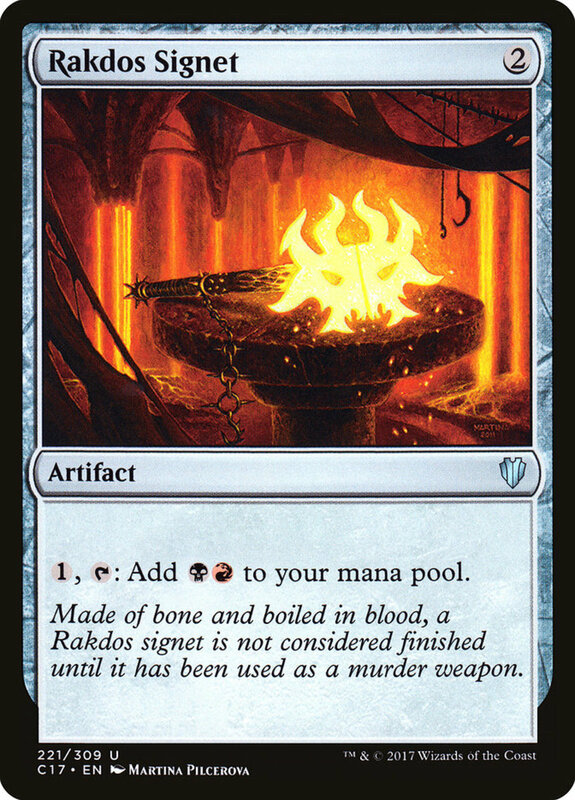 In Magic, mana ramping (rapidly amassing resources to cast expensive spells faster) is typically thought of as a primarily-green trait, but thanks to a heap of colorless ramp artifacts, any faction can access this strategy. Many of these cards are simple relics that tap for mana, but you might be surprised by just how many shapes and sizes they come in. They're especially useful in non-green commander decks, where you'll need a diverse bunch of 100 different cards (other than repeatable basic lands). 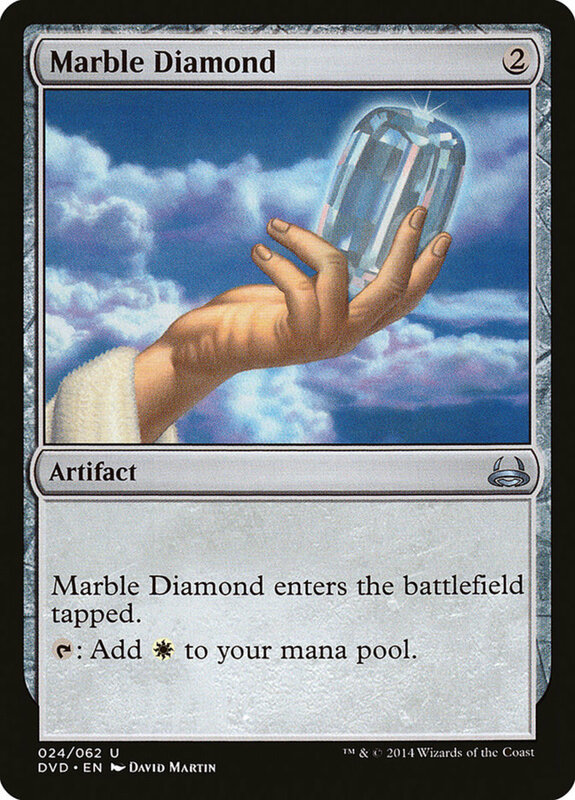 But with hundreds of potent mana-giving relics, which treasures reign supreme? 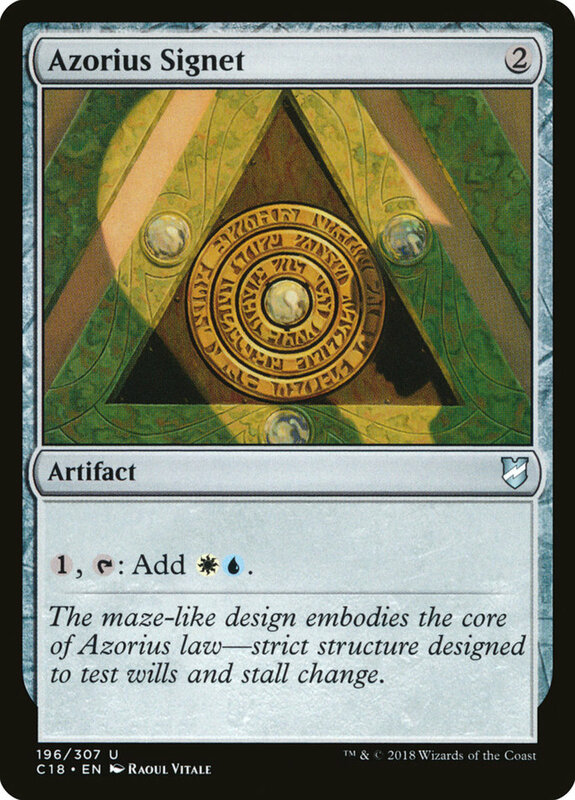 These are the thirty best mana artifacts in Magic: The Gathering! 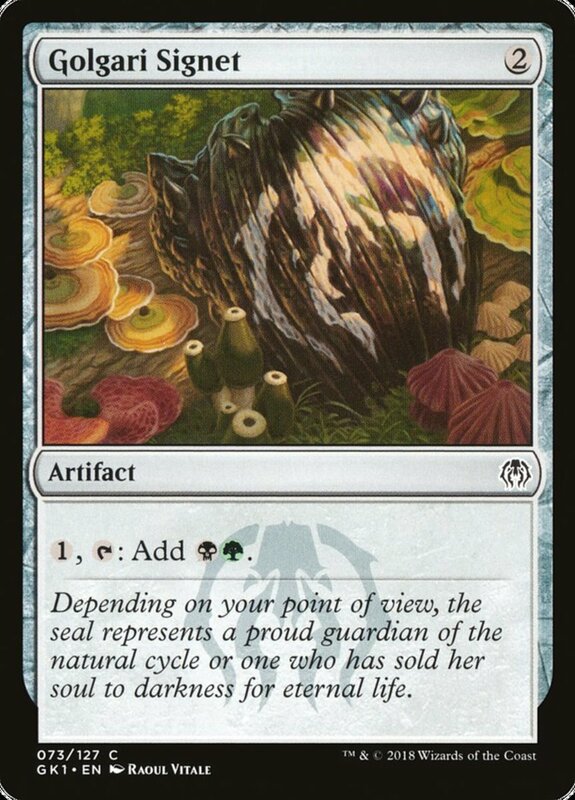 Like most artifacts, Thought Vessel accepts any color of mana, fitting perfectly into any deck. 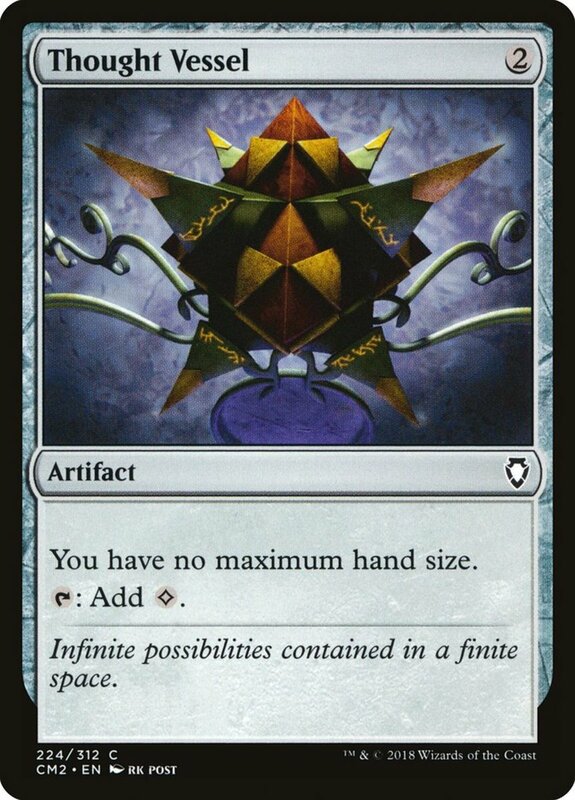 It only needs two, can tap for a colorless mana, and gives you no maximum hand size, letting you hoard as many cards as you like. Remember, artifacts (unlike creatures) don't need the haste trait to tap the turn they arrive, letting you immediately put them to good use. A high-risk, high-reward card best in monocolor builds, Extraplanar Lens needs three mana and its imprint trait exiles a land you control. If you lose Lens, you're not only down an artifact, but you've also lost a land, so exercise caution. 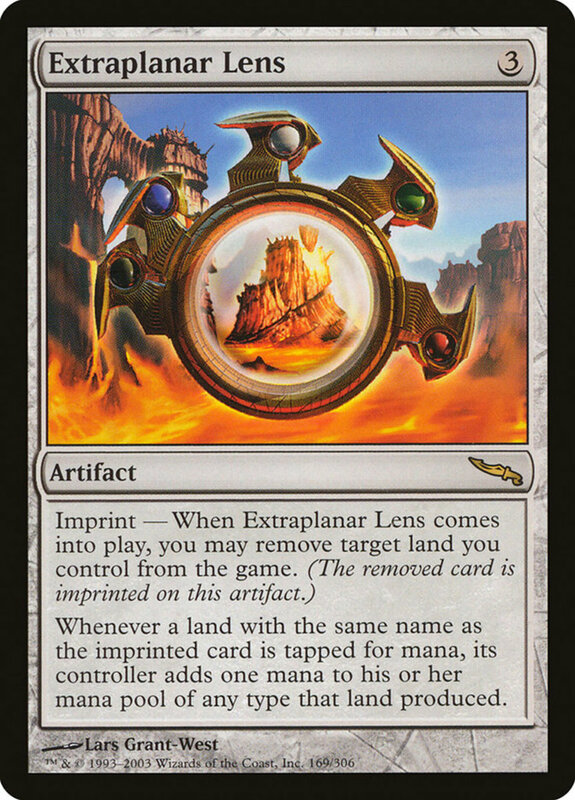 However, Lens lets any lands of the same name as your imprinted card tap for an additional mana. 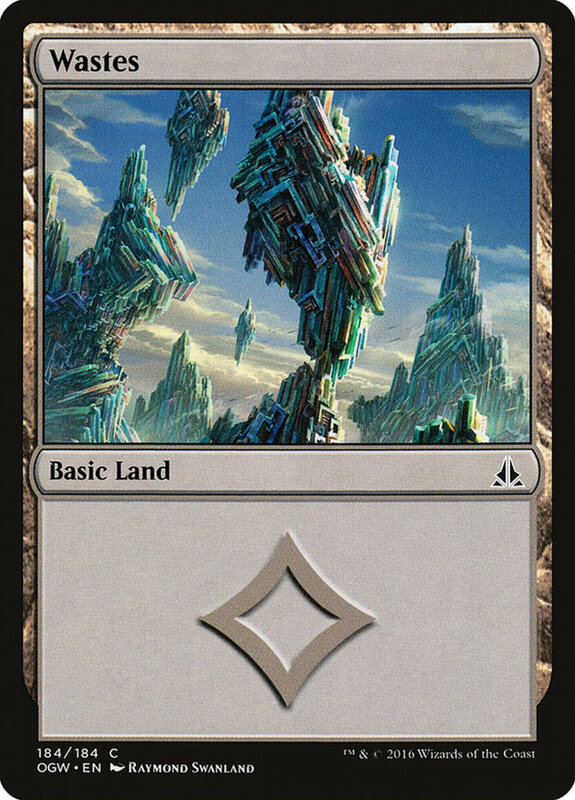 This can essentially double your resource production, but note that it also boosts opposing lands of the same name; consider implementing snow cards (each basic land comes in a snow variant) to minimize this risk. 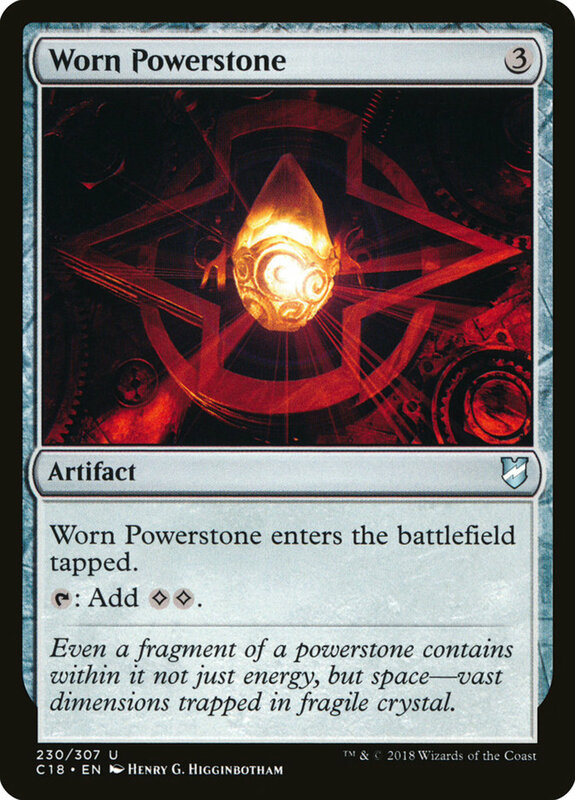 Essentially a more-expensive "Sol Ring", Worn Powerhouse takes three mana and enters exhausted, so you won't be able to access it immediately. However, it taps for two colorless mana, a fierce increase. Even most colored spells allow room for colorless mana, making Powerstone surprisingly beneficial no matter what hues you employ. 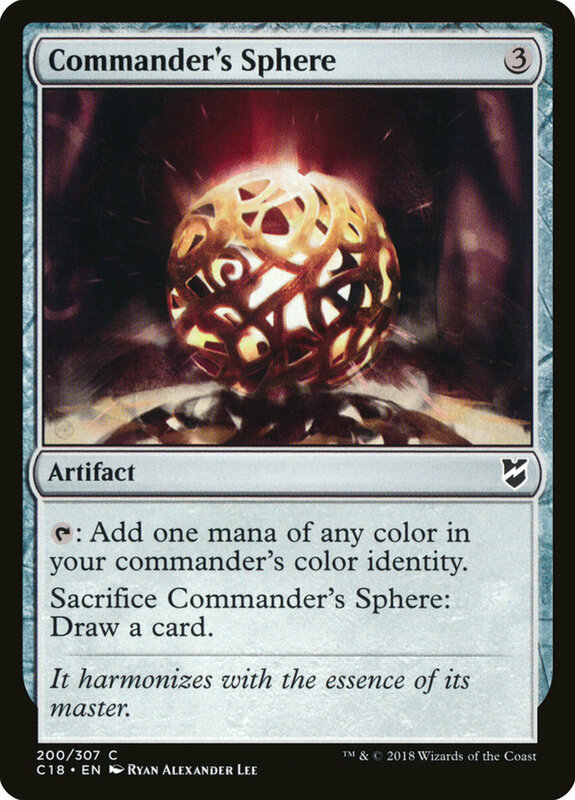 Designed for EDH format, Sphere taps to provide any mana of your commander's color identity—which gives any mana you need, as your general's colors are the only ones allowed in your deck. 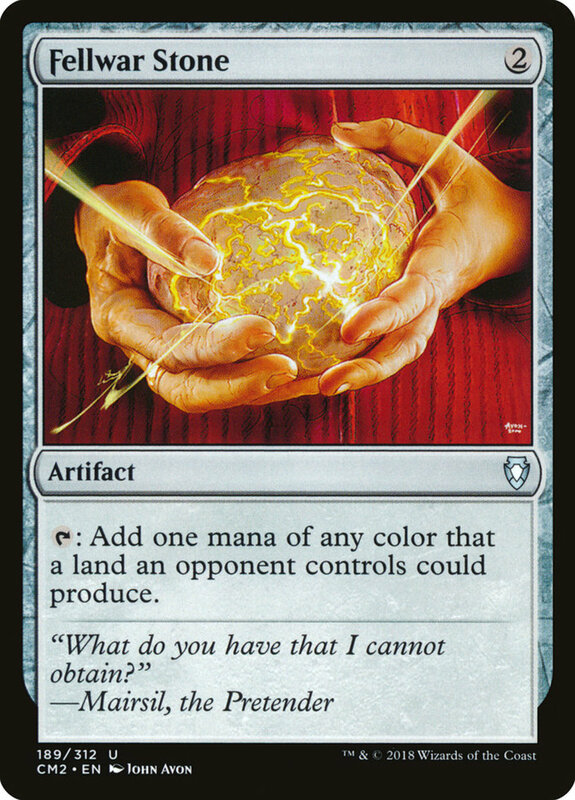 Plus, you can sacrifice Sphere to draw a card, an especially useful trait since it activates at instant speed, letting you trigger it in response to a removal and reap some final benefit from your treasure. 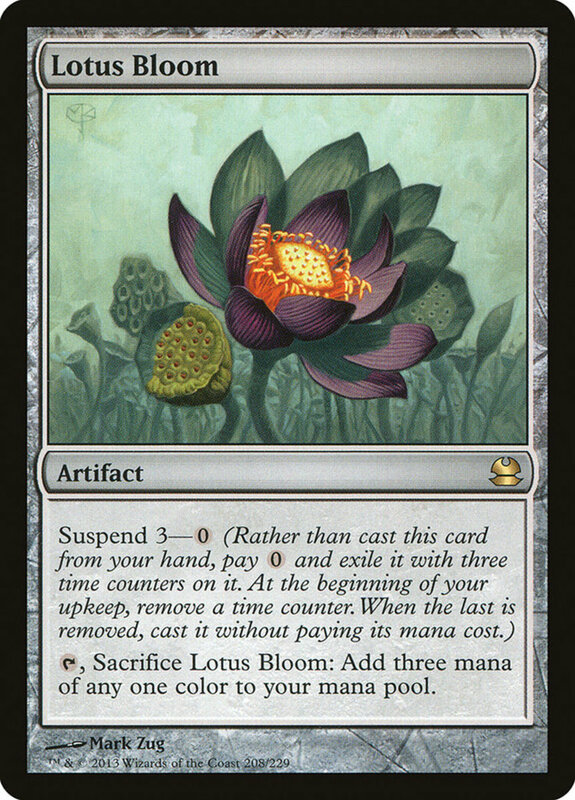 One of several artifacts based around the infamous "Black Lotus" (who won't appear today due to its ban in nearly every format), Gilded Lotus requires a hefty chunk of five mana, making it a good candidate for any artifact-fielding effects you brandish. To compensate, Gilded taps for a whopping three mana of any one color, a hefty boost that reserves the colorless spots of your spells for resources that need them. Thran Dynamo is a less-expensive Gilded Lotus, costing only four mana but still tapping for three. 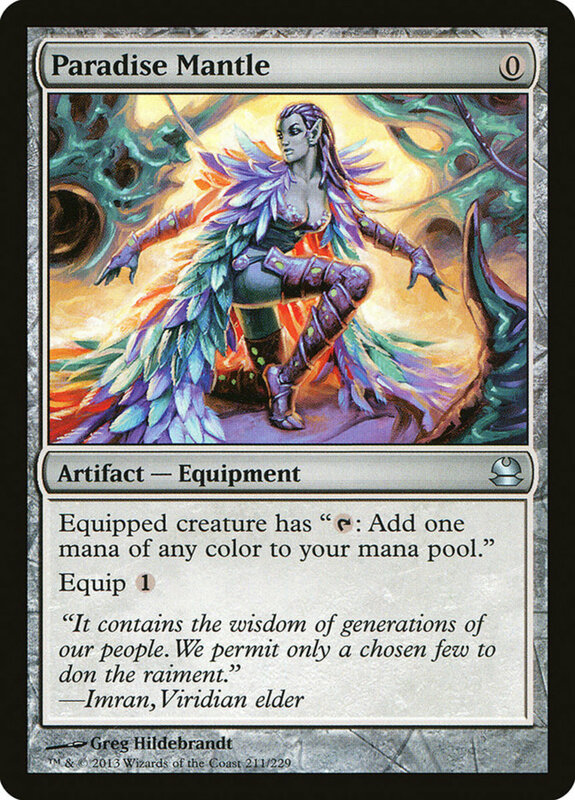 However, its mana is colorless, not quite as beneficial as Gilded's colored boon, but generally more helpful considering its lower price. 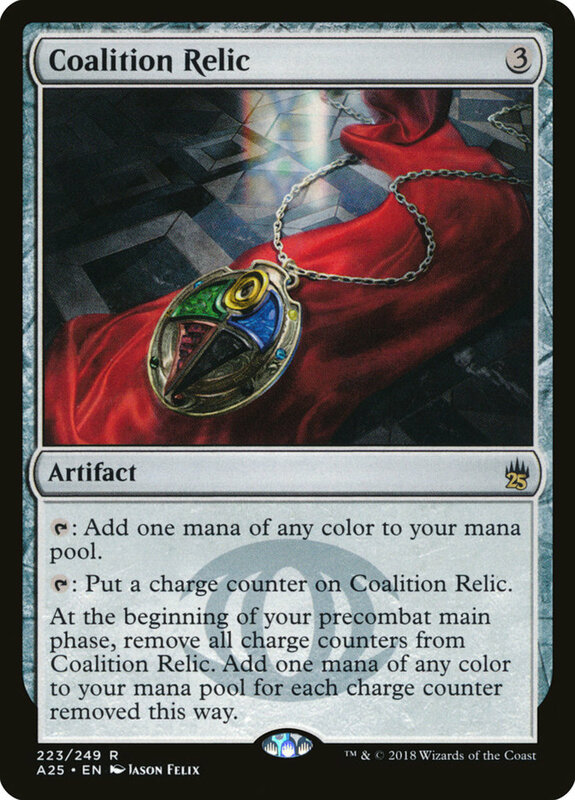 Coalition can tap for any color, useful in rainbow decks, but it can also tap to store a charge counter, which you automatically remove at the start of your precombat main phase to add a mana of any color. Basically, you can stockpile your resources to have a turn where you gain two mana instead of one. 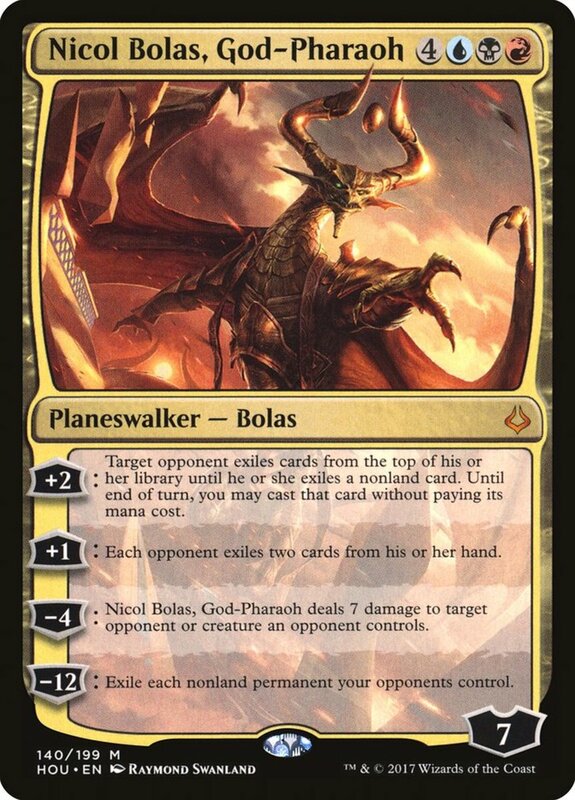 Plus, any spell that utilizes charge counters works especially with cards that bear proliferate (letting them increase the number of counters on any permanent) like "Atraxa, Praetors' Voice", one of the most popular commanders in EDH format. An automatic inclusion for my Atraxa builds and a strong candidate for any deck, I definitely recommend snagging Relic while it's price tag is under three dollars (it often climbs above seven)! 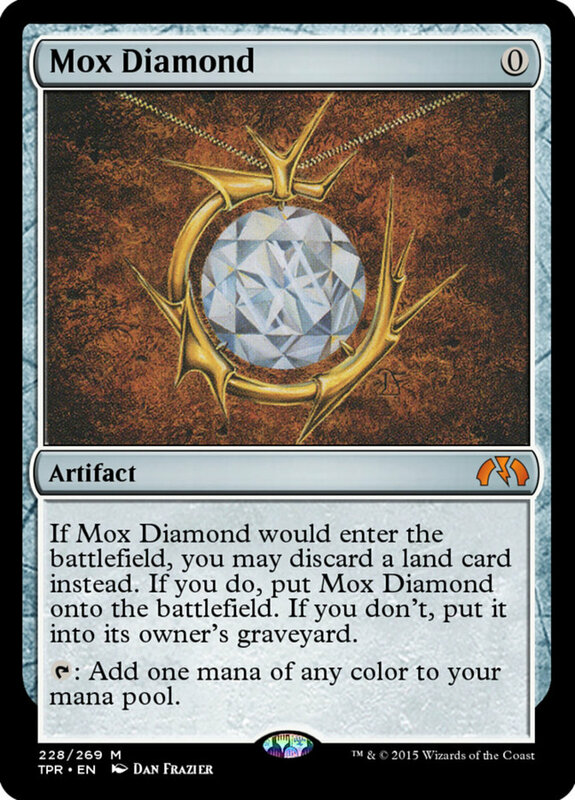 Mox Diamond adeptly avoids the ban of most Mox artifacts (Sapphire, Ruby, etc.) but offers a similar benefit. It costs zero mana, letting you field it for free, but you sacrifice it unless you discard a land when you play it. 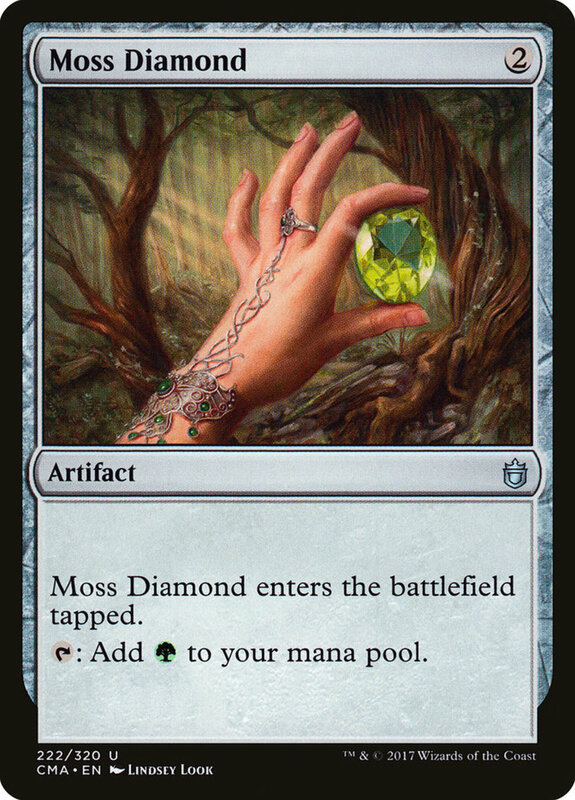 Still, Diamond can tap for a mana of any color, and even though you lose a land from hand when you play it, remember that you can only field one land per turn—which Diamond doesn't take up. 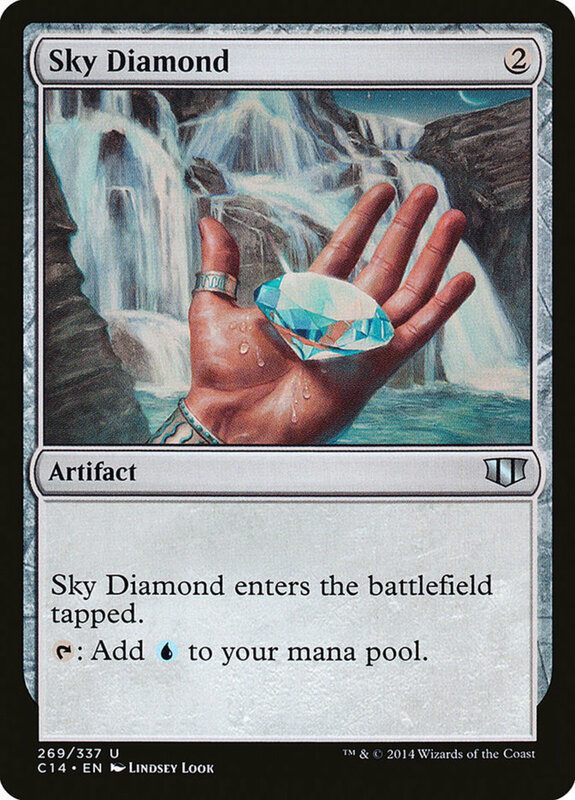 Thus, if you have enough cards in hand, you can increase your resource production by two rather than one in a single turn by combining Diamond with your usual land play. 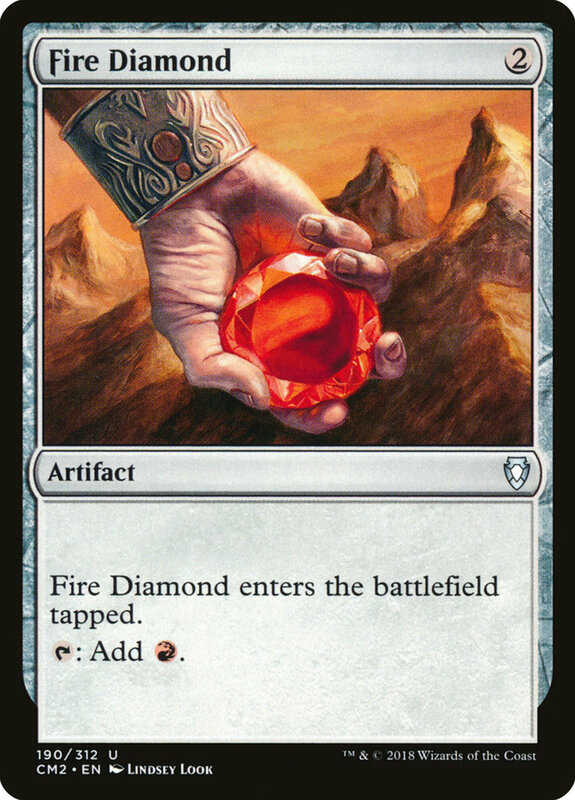 A bit unpredictable, but still an engaging and competitive card, Fellwar Stone only needs two mana and taps for any color that an opposing land could produce. 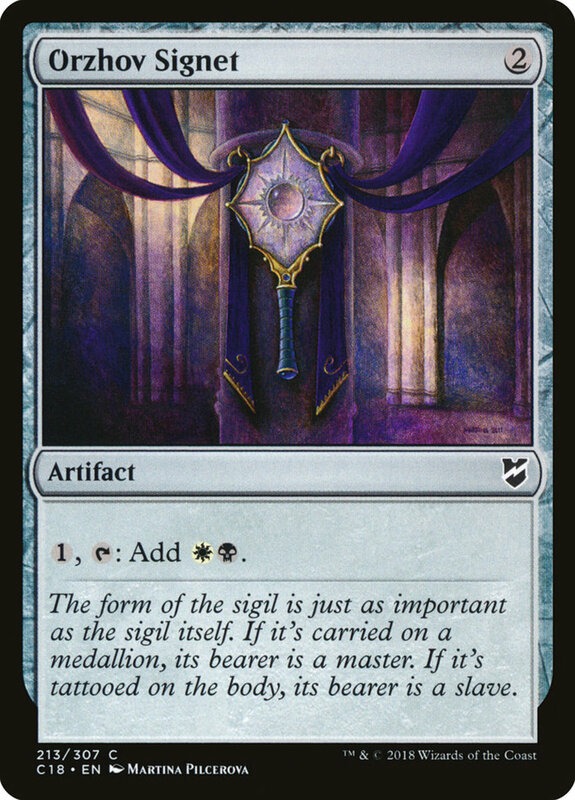 Whether this will or won't give you the colors you need is anyone's guess, but you can still use the wrong type as colorless mana, and playing multiplayer games will increase your odds. 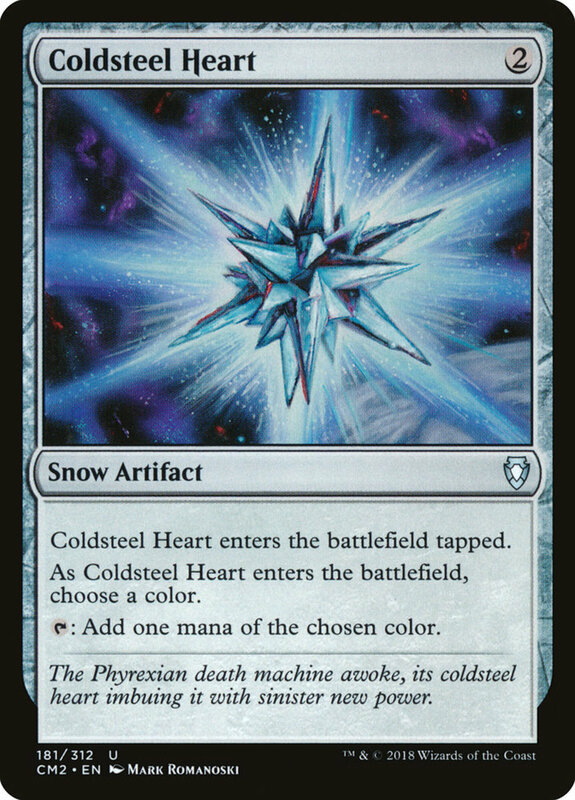 A rare snow artifact, Coldsteel carries some interesting synergies and only costs two mana. It enters tapped, but you choose a color on entrance that Coldsteel can later tap to provide. 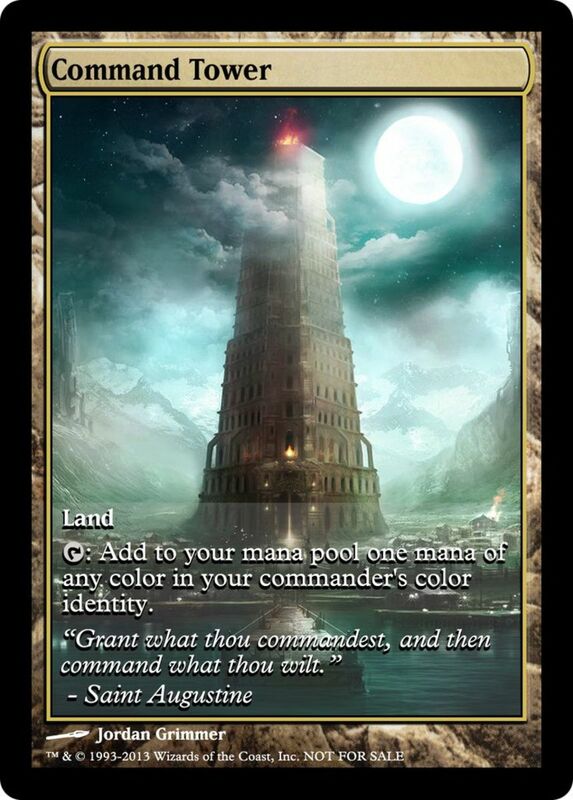 A nice way to cover for whatever land types you haven't yet drawn in multicolor decks, but choose wisely, as you can't later alter your decision. 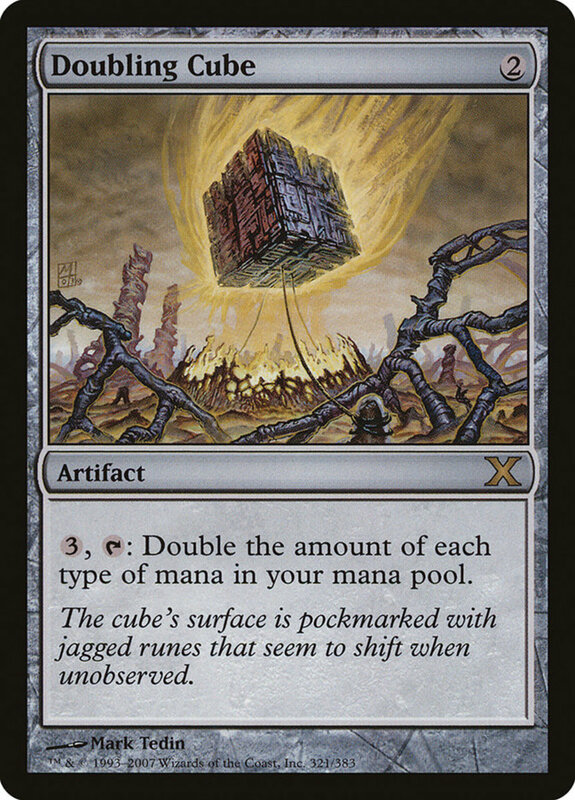 Unlike many of today's entries, Doubling Cube actually works better in the later stages of your match. It needs just two mana to play, but three more whenever utilizing its tap effect. 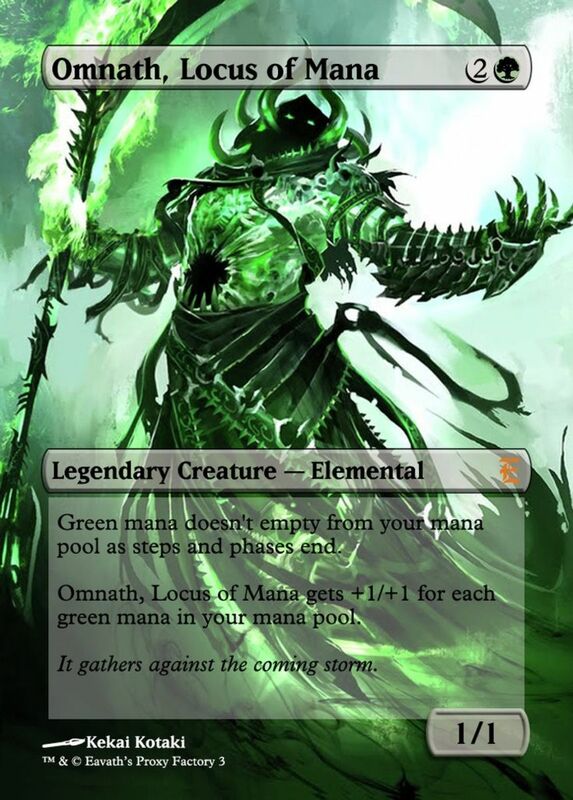 However, after the fee, you double the amount of mana in your pool, letting you gain huge amounts of resources (especially with cards like "Omnath, Locus of Mana") at once. 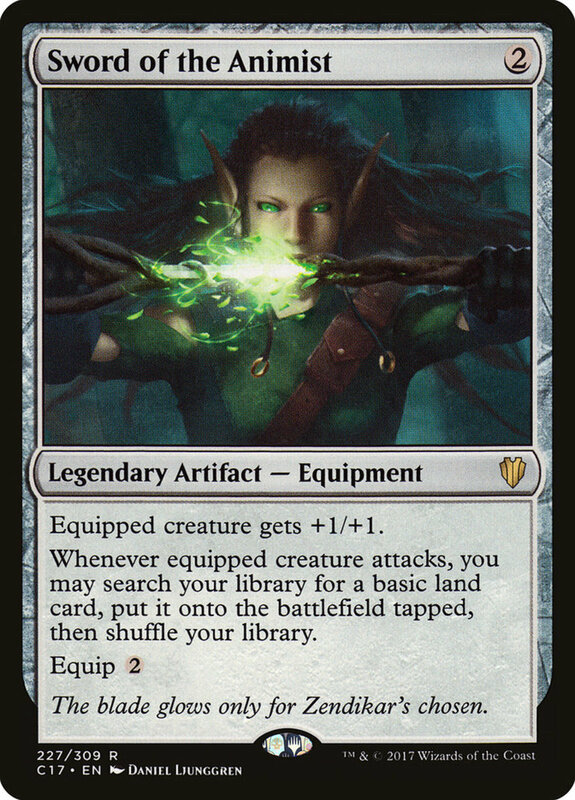 One of the game's best artifact equipment spells, you pay two mana to initially field Animist, then two more to actually attach it to a creature (but you can divide this over multiple turns if needed). Not only does the equipped monster gain +1/+1 power and toughness, when it attacks, you can play a basic land from your deck tapped onto the field! 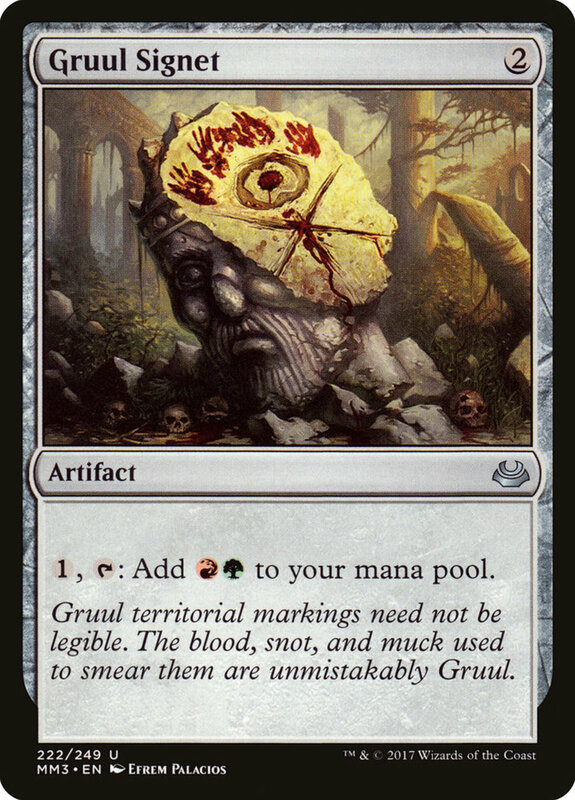 Even if Animist or its beholder later gets destroyed, any searched lands will remain, indefinitely fueling your mana output. 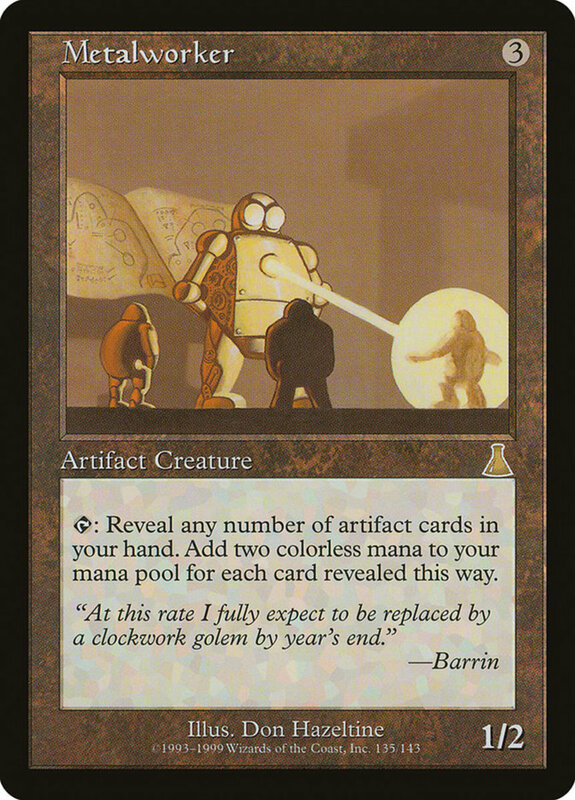 An artifact creature blend, Metalworker enters with a disappointing 1/2 stats, but he's crucial for artifact-heavy builds. He can tap and reveal any number of artifacts from your hand to gain two colorless mana for each, a monstrous increase that can potentially provide six or more resources at once! Here's another few cards based off Black Lotus. Blossom needs just two mana, and you can place a petal counter on it during your upkeep. 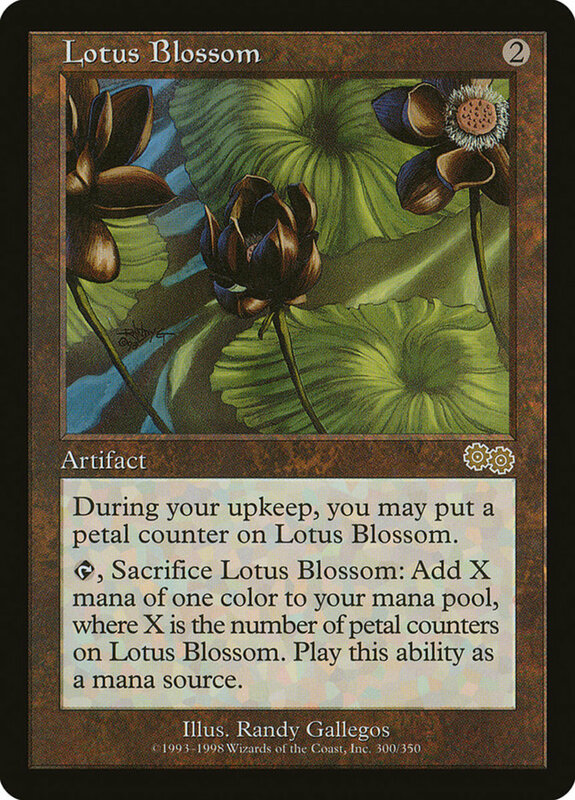 Then, at any time, you can sacrifice Blossom to add X mana, where X is the number of petal counters it had. 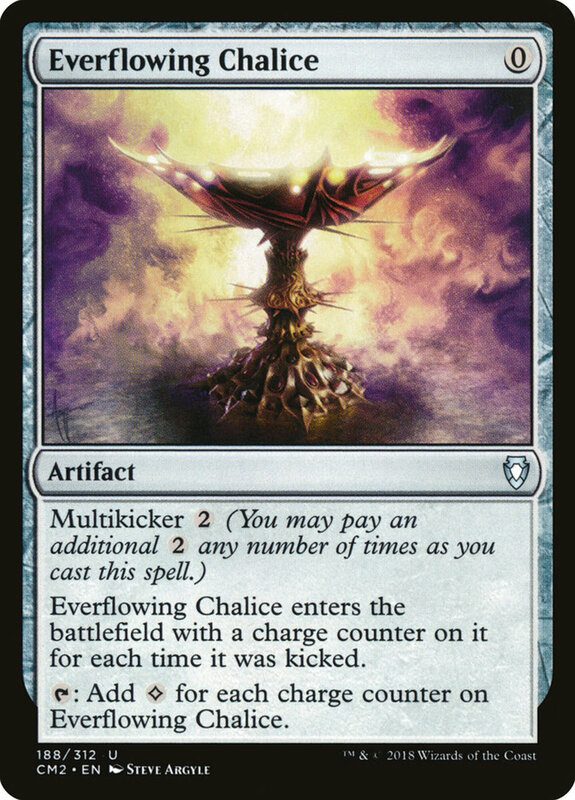 A powerful (albeit one-time) effect; remember to use Atraxa's proliferate to quickly amass Blossom's counters. Lotus Bloom basically is Black Lotus—just with a delay. 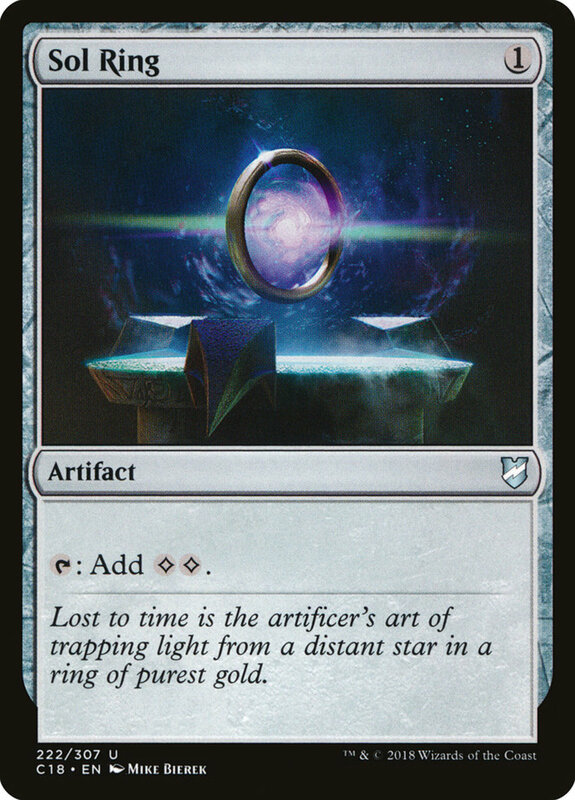 You suspend it for free from your hand into exile with three time counters, removing one during your upkeep step. 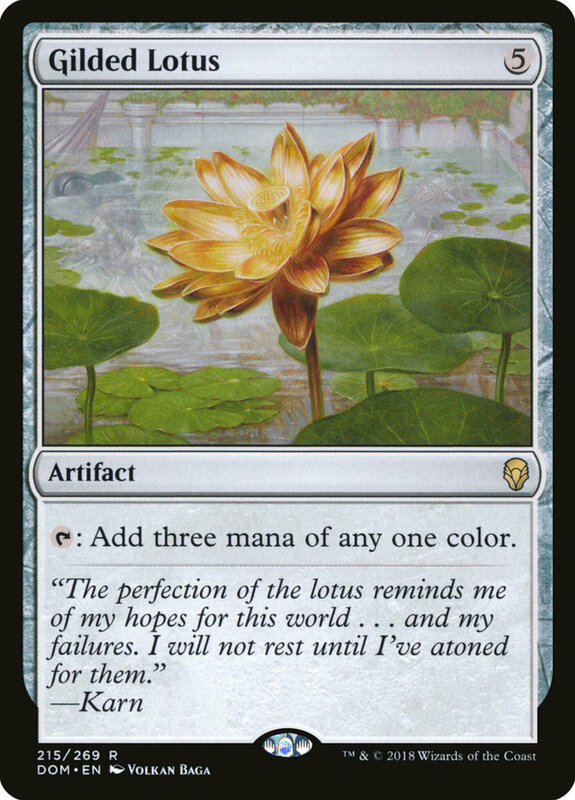 When the last is gone, Bloom enters the field, now mimicking its counterpart's effect, tapping and sacrificing itself to grant a fierce three mana of any color. Bloom's free entrance also makes a great setup for surge cards, whose prices are reduced if you've previously cast another spell during that round. 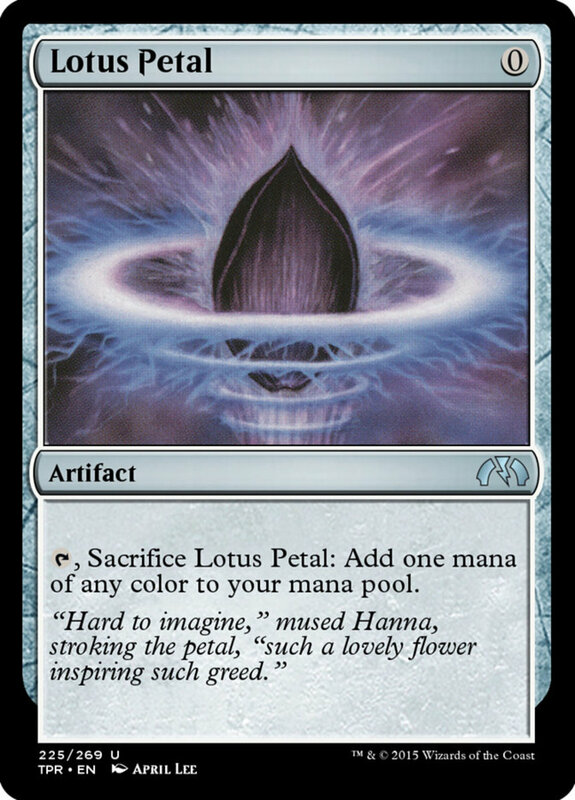 Yet another Lotus spin-off, Petal costs zero mana, but now only sacrifices and taps for a single mana of any color. 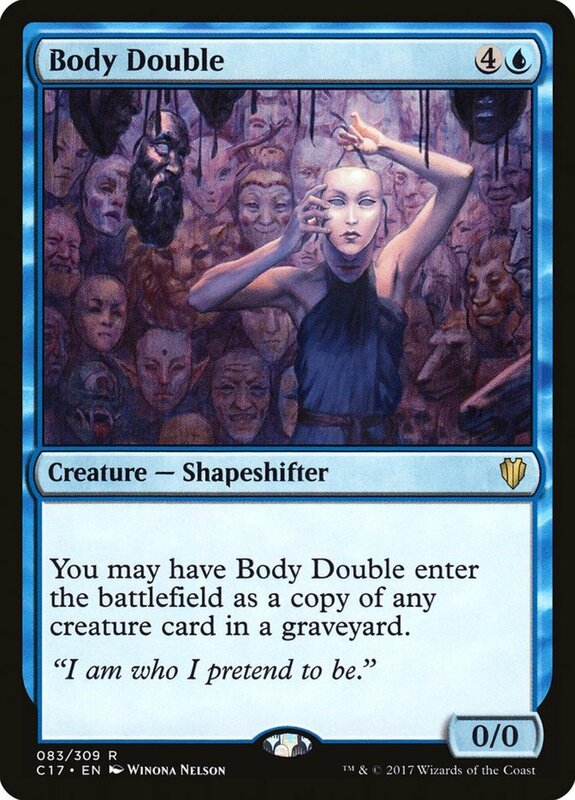 While this is much weaker than its infamous counterpart, it's still a strong ability that cranks your turn's mana production beyond its normal limits, also stocking your graveyard with an artifact (useful for spells with "delirium" or "threshold" graveyard conditions). 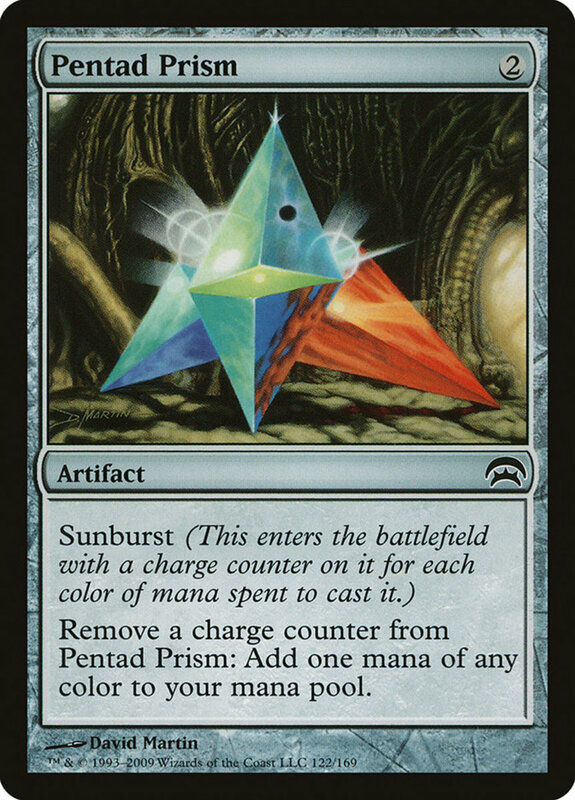 Designed for multicolor decks, Pentad Prism enters the field with a number of charge counters equal to the types of different mana used to play it, which will ideally be two. You can remove a charge counter to add a mana of any color, and since there's no tapping involved, you can spend both in a single turn if you like! 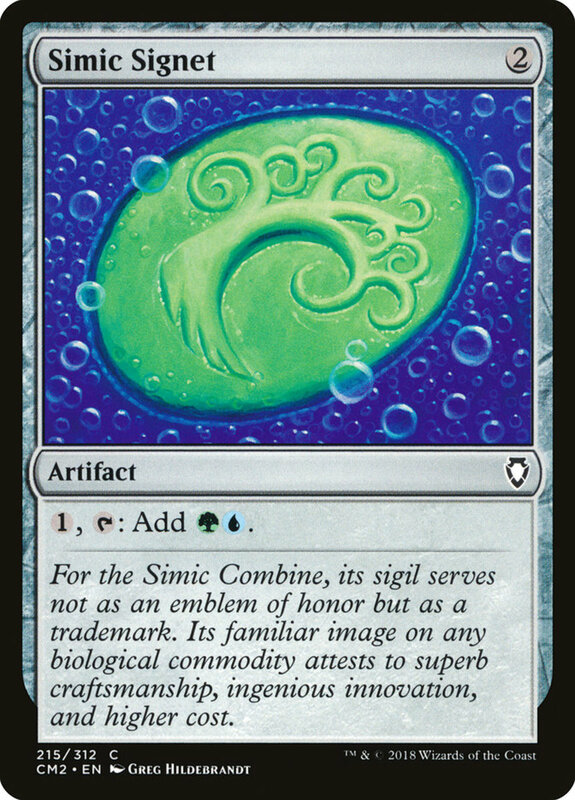 Powerful in any rainbow deck, and particularly useful alongside Atraxa's counter-proliferating. 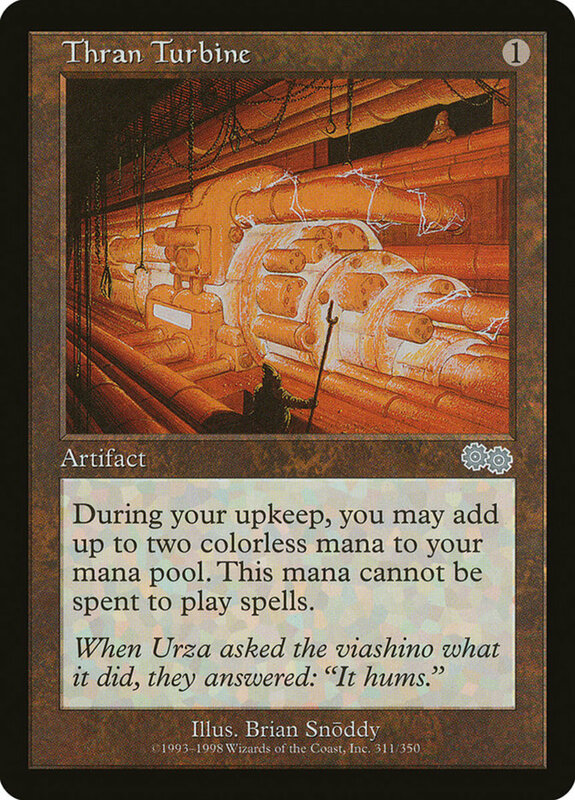 Thran Turbine works great in any deck with permanents that spend mana once already fielded. It only costs a single unit and grants two colorless mana during your upkeep. However, you can't spend this mana to cast spells (note that it would fade before your main phase anyway). 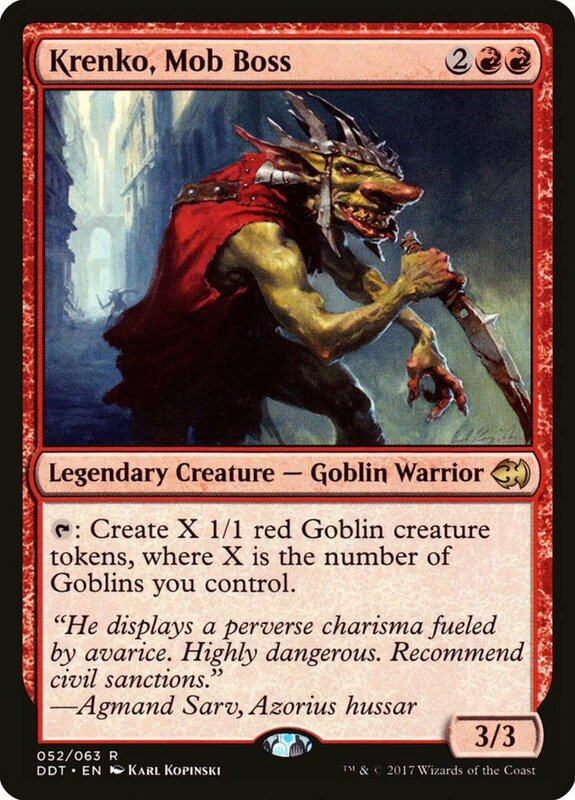 That said, you can still use it for abilities of cards you already control; the possibilities are nearly endless, but recommended synergies include "Jhoira of the Ghitu" and "Kruphix, God of Horizons". Another artifact equipment, Paradise Mantle is free to cast and only needs one mana to attach to a unit, who can now tap to add a mana of any color to your pool. With this, take advantage of block-taps, where you can declare an untapped unit you control as a blocker when swung at, then tap it, simultaneously defending and gaining your mana (just be sure to spend it before it phases out). Many of the best mana artifacts don't untap during your untap step, which can make them hard to refresh. Basalt is such a card, only needing three mana and tapping for a whopping three, but to refresh it, you'll have to spend three resources. Still, it makes a great one-off that you can simply ignore for the rest of the game, or rejuvenate with the auto-untaps of cards like "Seedborn Muse". 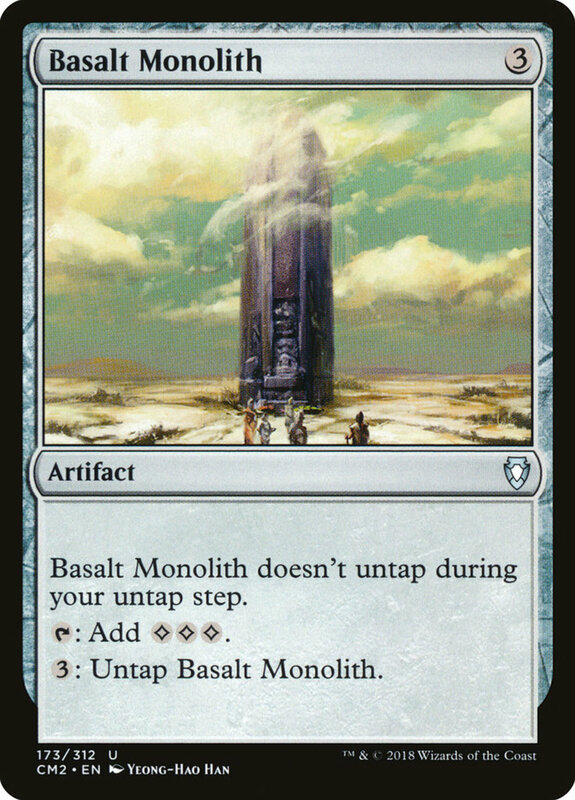 While it costs more mana that some of our upcoming cards, Basalt doesn't damage you during your upkeep (some of them will), adds a fierce amount of mana, and is a favorite of mine in budget decks considering its affordable price of less than three dollars! 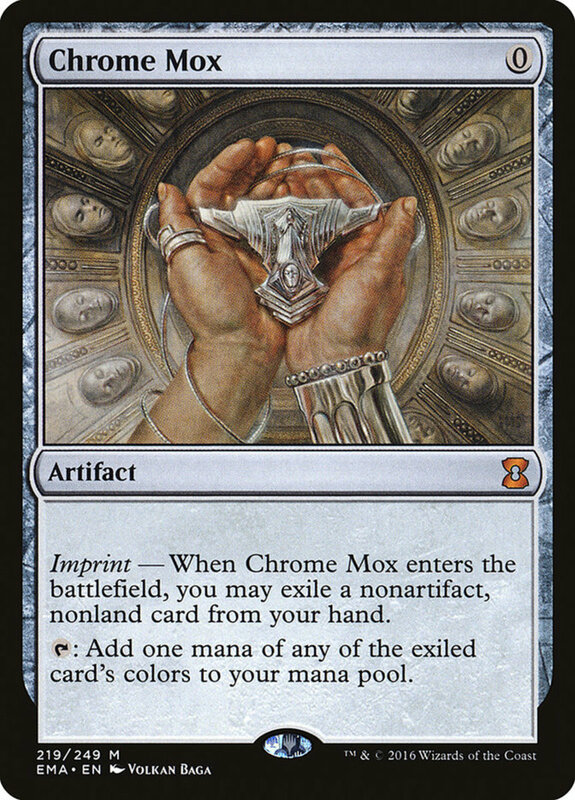 Chrome Mox functions similarly to Mox Diamond, but with a little more flexibility. It's free to play, but you imprint it by exiling a nonland, nonartifact you control. Chrome can then tap to add any of the exiled spell's colors. Once again, your hand is reduced, but since you have more card types you can choose to toss (rather than just a land), Chrome is an overall safer play. 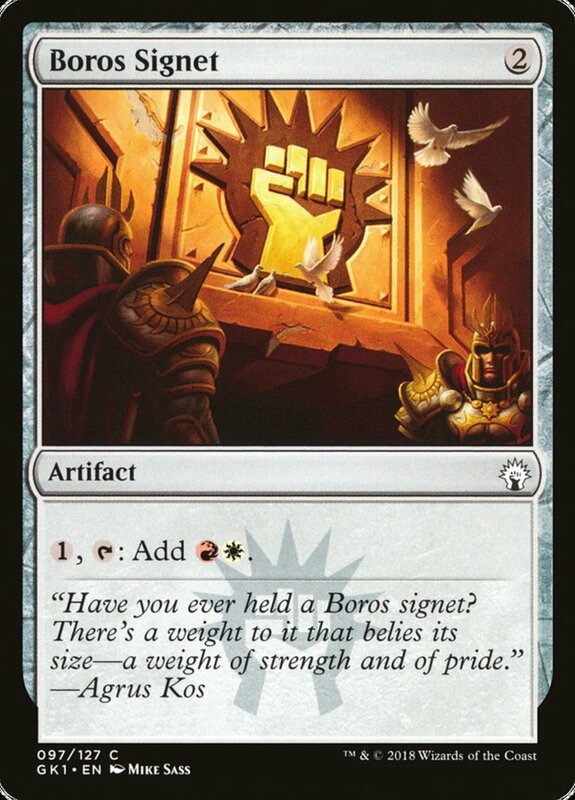 Designed specifically for the red faction, Gauntlet offers two excellent effects for just four mana, essentially serving as a cheaper "Caged Sun". 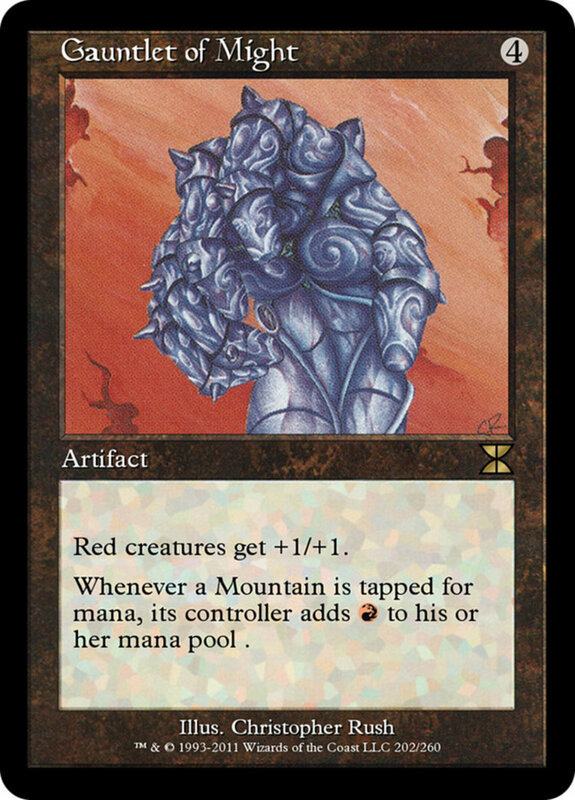 All red creatures get +1/+1, and all mountains tap for an extra red mana. The risk here is how these boosts may also benefit your opponents, but it's very much worth it in monored decks. Remember, only mountains can make use of the extra resources, so lands that can give red mana but aren't mountains (like "Temple of Malice") won't aid your opponents, and few commander decks are mono-red, so you shouldn't have too much trouble. Chalice skillfully adapts to fit your current situation. When it enters, you kick it with two mana any number of times, and it acquires a charge counter for each. Then, it can tap to add a single colorless mana per counter. This can grant a simple two-cost one-mana relic or a six-cost three-mana depending on what you can afford. It's also an excellent candidate for proliferate abilities. 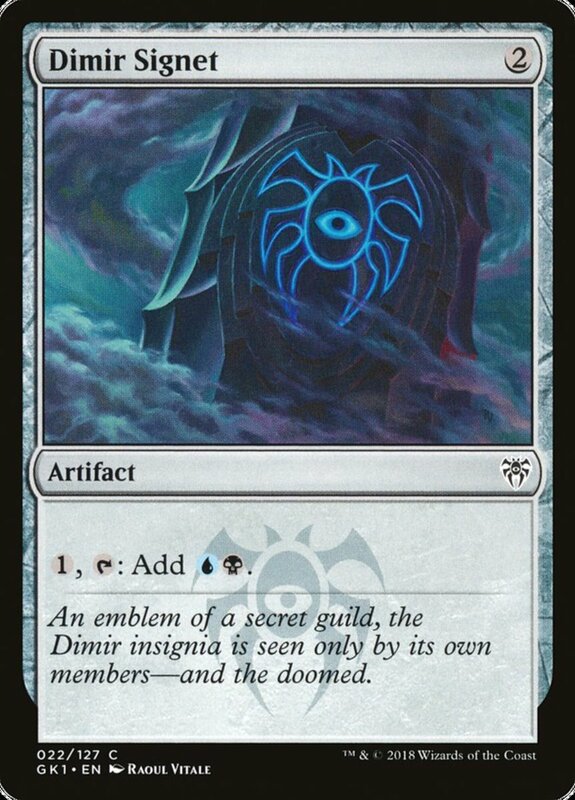 One of my favorite cards to play in commander (again, stack it with Atraxa), I especially recommend Chalice for its affordable price, costing less than two dollars! 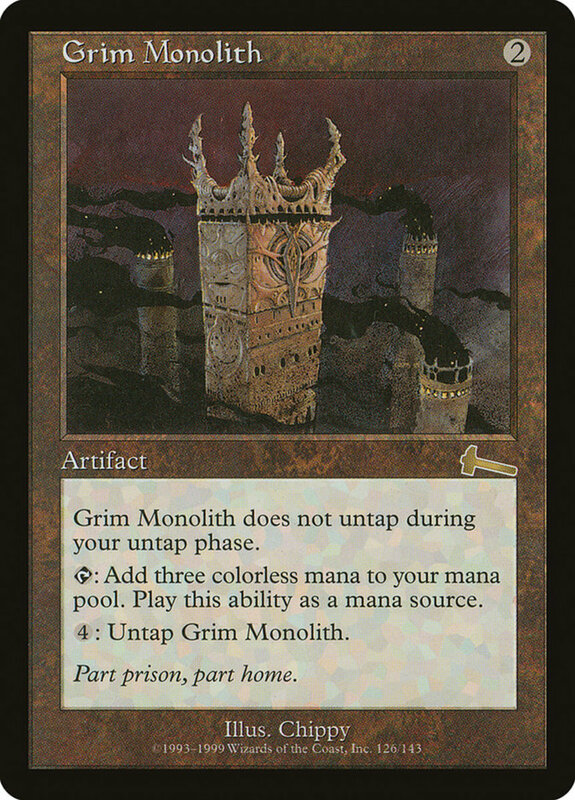 Another card that doesn't untap during your untap step, Grim Monolith now needs four mana to manually untap. 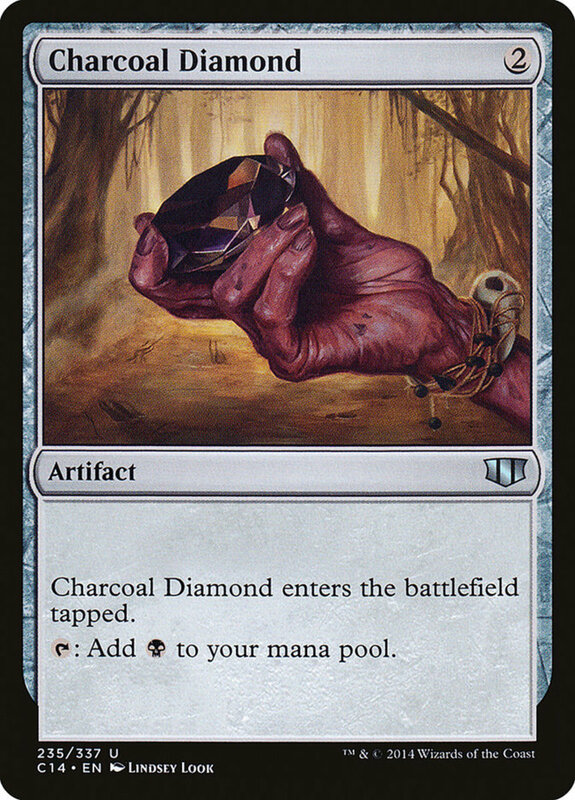 However, its base cost of two makes it more affordable than Basalt, and it similarly taps for three colorless mana. Once you've spent it, I'd recommend simply ignoring Grim's price unless you truly have leftover resources, or you can use the refreshes of cards like "Brago, King Eternal" to pivot it back to ready position. 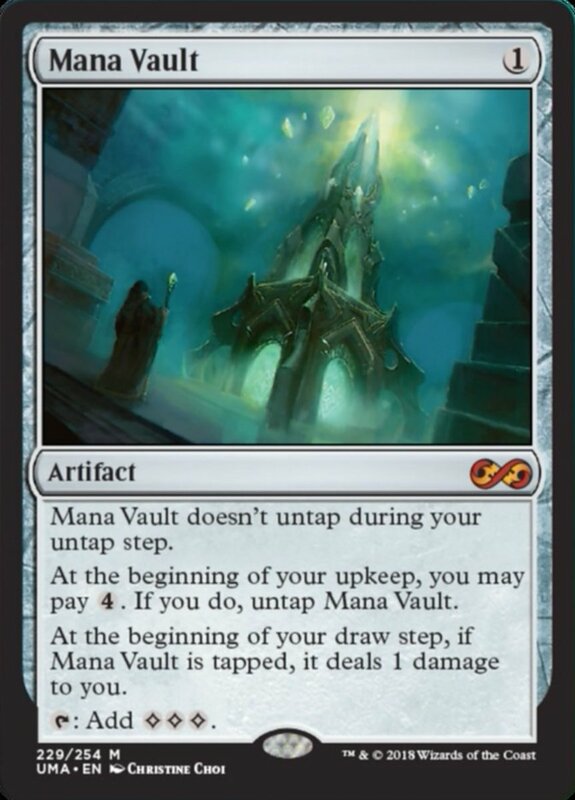 Mana Vault further reduces the price of your three-mana-tapping artifacts, needing just one mana, and like its counterparts, it won't untap during your upkeep. 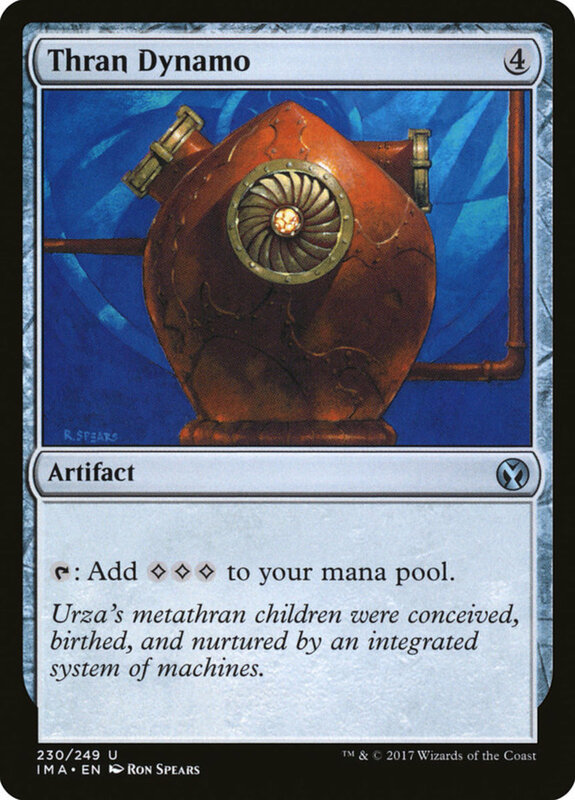 You can spend four mana during your upkeep to untap it, but really, Vault's another nice one-off. 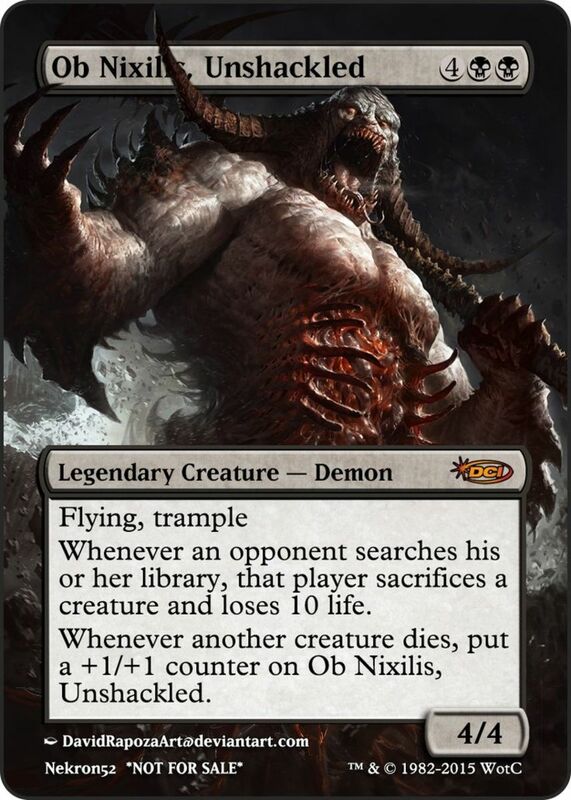 That said, it deals one damage to you while tapped during your draw step, but that's a slow drain that hardly detracts from its fierce powers (especially with the higher life totals in commander). The true king of all Diamonds, Lion's Eye also bears a Black Lotus-like effect. 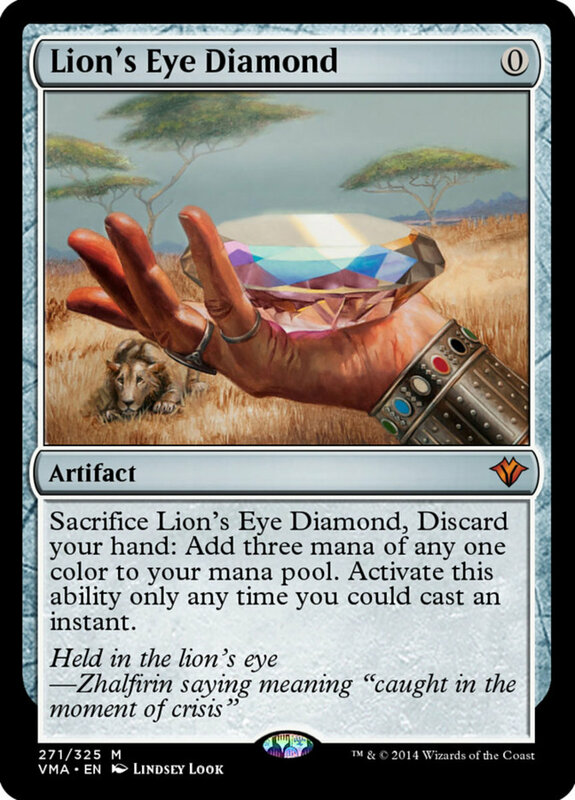 It's free and sacrifices itself to add a whopping three mana of any color, but you now must also discard your hand. Note that this leaves you with no spells in hand to spend mana for, so make sure your fielded cards (or ones in your graveyard with flashback) can make use of your extra resources. 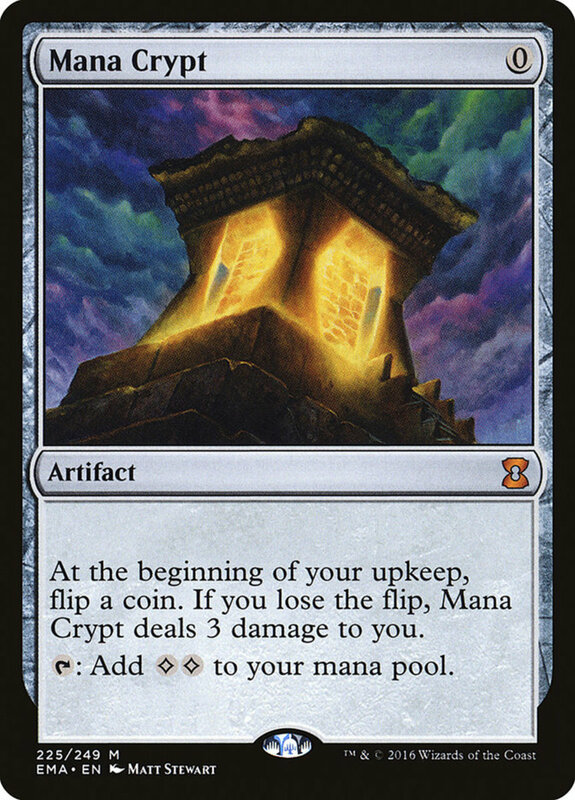 Compared to Mana Vault, Mana Crypt only adds two colorless mana. However, it's free to cast and actually untaps at your untap step! The only downside is that you flip a coin at your upkeep (whether tapped or not) and take three damage if you lose it. A free two mana that actually untaps and only has a chance to damage me each turn? Yes, please. An excellent turn one spell (though it's fantastic on any move), Sol Ring simply taps for two mana. Even on the turn you play it, you've gained a net total of one mana, and on future rounds, it offers two. Just think about how overpowered this is. Worn Powerstone, still considered a good card, takes three times as much mana to apply the same effect, and it enters tapped! Sol Ring and Black Lotus are often hailed as the best artifacts in Magic, and for good reason, but unlike its banned counterpart, you can actually legally play Ring in several formats. We've examined the game's best mana-providing relics; here's a few suggestions to further support your theme. 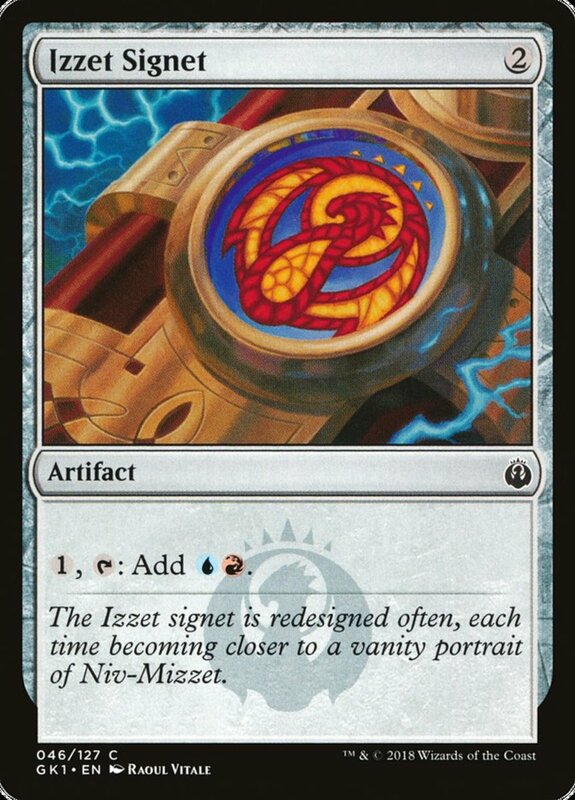 Remember, Metalworker adds mana based on the number of artifacts in your hand, and planeswalkers Daretti and Tezzeret both offer several artifact-focused traits. Plus, the white and red factions are particularly useful for supporting equipment spells if you lean towards the weapon subtype of artifacts. With thousands of supports, you can take your deck list in any direction you like. 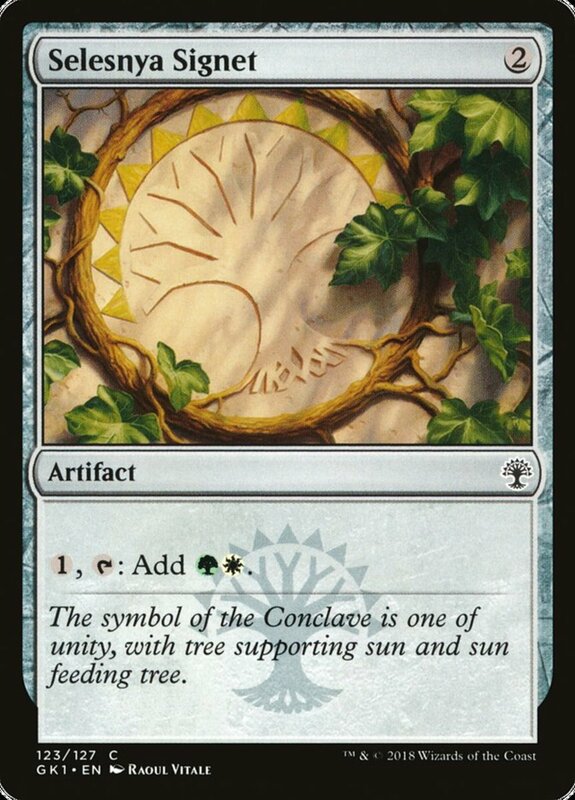 But for now, as we eagerly await Wizards of the Coast's next expansion of mana-producing artifacts, vote for your favorite card and I'll see you at our next MTG countdown!